Gathering a collection of lessons and activities on main ideas will help you to put together plans to help your first grade students with reading comprehension. Combining some of the top activities with the best lesson plans will help you to achieve optimal success in the classroom. These following links provide you with full lesson plans on main ideas for first graders. Tweak them, if you need to, in order to suit your personal needs and those of your students. Try these activities, some of which are courtesy of LoveToKnow's Activities for Teaching Main Idea article. Some have been modified in order to be more suitable for a first grade audience. Have students read a passage and highlight the main idea. Play the two word description game. Ask students to describe the main idea of pictures, as opposed to text. Use the hamburger model to teach the concept of main idea to early learners. Distribute written work that the students have completed themselves. Ask them to identify the main idea in their own work. Use a tree trunk to symbolize the main idea, and the branches to symbolize details. Read a story and ask for students' opinions about the main idea. Compare titles to main ideas. Explain to students how the title can be a clue into the main idea. You might not be 100 percent certain regarding how to execute some of the ideas listed. After reading a very brief passage or a paragraph, ask students to sum up what they have read (or have heard) in just a few words. For such a young age level, you might need to allow three to five words. In any case, the primary purpose is to get students to synthesize a large amount of information into the most important points. Text can be overwhelming for students at any age, especially first graders. Therefore, distribute pictures and ask students to tell you what the picture is about. This method is a non-threatening way to introduce the concept of the main idea. In these scenarios, you will draw pictures or distribute handouts with graphic representations of the main idea. In the hamburger model, the main idea acts as the meat, and the bun, pickles, ketchup, and so forth are the details supporting and adding flavor to that main idea. In the tree model, the trunk acts as the main idea, while the branches and leaves bring live and vigor to that concept. The hamburger model may seem slightly more attractive; however, it is also a bit more difficult to grasp. You should save that model for a group of students who are a bit more advanced or are further along in their study of the main idea, and use the tree trunk model for beginning learners. "Lessons and Activities on Main Ideas for First Grade." YourDictionary, n.d. Web. 25 April 2019. 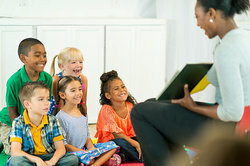 <https://education.yourdictionary.com/for-teachers/lessons-and-activities-on-main-idea-first-grade.html>.